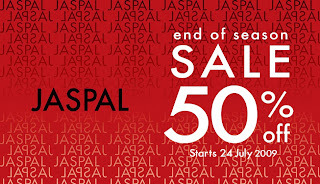 Starting July 24th is Jaspal's End of Season Sale, featuring discounts of 50 % off. Jaspal has been a leading brand in the Thai fashion industry since 1970s when it opened its first store here. Today, it has grown into a renowned elite brand for fashionable ready-to-wear clothing at affordable prices, with more than 26 stores throughout Thailand and some outlets in Malaysia. Jaspal's clothing and accessories (including bags, shoes, belts and ties) stand out for their unique designs, made with superior quality imported and local fabrics, and immaculate workmanship.